Starting tomorrow I will be at Walt Disney World for a last trip with my father before my wedding and for Epcot’s 25th Anniversary. When I come back I hope to have all kinds of information to share with all of you, as well as photographs, and maybe a surprise or two. I will have detailed looks at the new Haunted Mansion, Epcot’s 25th, including my thoughts on the wandless Spaceship Earth, and a story about conquering my worst fear in all of Walt Disney World. I will also be starting a new segment, a supplement if you will to the Young Adventurers series, it will be called Paths to Adventure. This goes back to my problem with the amount of information tailored to children visiting Walt Disney World. The paths to Adventure will be walk-throughs of various lands/sections/area/whatever you would like to call them of the various parks and resorts with information for children. Each of these will tell children where to look, and what to look for, as the blaze a trail to a new adventure or an old haunting ground. Since this is the Year of A Million Dreams, let me tell you a few of my dreams I have laid out for myself on this trip, aside from spending a night in Cinderella Castle. I would love to meet Jeff Pepper and thank him in person, as I have on this site, for what he has brought to our community. I would also love to meet Lou Mongello and Marty Sklar, both Disney Legends in their own ways. I want to bring back new ideas and new Magic for this site for those of you who have been so gracious to stick with me as I travel into uncharted waters. I want to have fun meeting old and new Disney friends, especially those of you from the Netcot message boards (Rock On!). And most important of all, I hope to have a Magical trip with my father that will bring us closer together. I hope you all come back and visit me next week when I return. I hope that those of you with children will enjoy the new Paths to Adventure division of the site. And for those of you unable to attend the Magic of Epcot’s 25th, I hope you know we will all feel you there with us in our hearts. If you have ever been anywhere in any of the parks then I guarantee that you have walked past an ice cream cart, seen one of these treats, had a smile creep across your face, and suddenly have an insatiable craving for ice cream. So take a moment out of your busy day, think about the time that an ice cream sandwich, popsicle, or fruit bar made you smile. Take that smile and enjoy the rest of your day. Lookin’ for a tempting treat? I think two of the most fun themed restaurants in all of Walt Disney World can both be found in the same park, Disney-MGM Studios (for those of you checking back on this article after January 2008, that would be Disney’s Hollywood Studios). Both are not to be missed for different reasons, but neither 50’s Prime Time Café nor Sci-Fi Dine In Theater Restaurant should be overlooked. Prime Time is in a league of its own for what I like to call a Streetmosphere restaurant. Your experience here is entirely dependant upon your wait staff, who is your long lost cousin, brother, sister, aunt, etc. The characters found here not only expect you to clean your plate, but the dishes as well. The idea here is that you eating dinner at one of the 50’s television shows kitchen table. Setting the table, perfect table manners, and having to sing should all be expected. Dinner consists of large portions of homemade favorites like Char Grilled Pork Loin, Fried Chicken, Post Roast, and Stuffed Peppers. If you don’t have a sense humor and an ability to laugh at yourself, this will not be an enjoyable dining experience. However, if you can not take yourself so seriously, then you should have a fabulous time. My other favorite dive in the Studios is the Sci-Fi Dine In. Shakes, burgers, ribs, and Reubens are all typical fare here, but that is not the reason to dine here. No, this is another restaurant where it is your surroundings that make all the difference. Your table is actually in a car that is park at a Drive-In after dark. This evening’s feature? What else, so bad their good black and white Science Fiction B Movies. For those of us who miss the Drive-In, or those who have always wanted to see what was one was like, this is as close as some of us will ever get. So, pull up the parking break, grab a thick shake, and enjoy the rocket-y badness. Since my upcoming trip will be so short, I have made the unfortunates decision to not make a reservation for my absolute favorite dinner dining experience in any resort. That would be the sensational buffet at Animal Kingdom Lodge’s Boma. If you have ever stayed at, or visited, the Animal Kingdom Lodge you know how meticulously themed this resort is. The dining fare at Boma is no exception. Though the seating area is rather open it is surrounded by what appear to be fences. This makes sense since the word Boma actually means an enclosed area, usually for cattle and other animals, in Swahili. However, my favorite detail of Boma rests on the walls just outside the restaurant, in the waiting area near the phones and restrooms. Perched on the walls are very colorful baskets. Upon first glance they appear to be nothing extraordinary. However, if you take a second, or third, look, and read the plaque next to them, you will find that they are actually weaved from stray scraps of colored telephone wire into glorious patterns. It amazes me that in this age of having shiny technology all around us craftsmanship is still valued highly, and that the human ability to make something out of nothing is still vital in some parts of the world. It truly humbles me. Once inside you are met with all sorts of food options, from Chicken Corn Porridge, Sweet Potato Pancakes, Couscous Marrakesh, to Durban Chicken, Pap, and other roasted meats, and each and every one is worth a bite of your time. Desserts as well range from the subtly delicious, like the fresh fruit tarts, to the insanely divine of the Zebra Domes. My absolutely favorite way to start a meal is the Watermelon Rind Salad, and the only way I can conclude a meal is with the Chocolate Mousse Crunch. Both recipes are available after the article. This is not your typical buffet by any stretch of the imagination. Yet, if you are looking to broaden your dining horizons, which if you are eating in Walt Disney World I hope you are aware that there are astonishing and surprising options available beyond chicken tenders and burgers, this is definitely the place to start. The dishes may have daunting names, but their tastes will be comforting and familiar with a flair. In a small pot, heat the dressing ingredients until the sugar melts. Prepare flexi pan mold, 2-inch diameter muffin shape. Melt semi-sweet chocolate squares for mousse. Whip heavy cream and sugar to very soft peaks. Soften gelatin in cold water until soft. Remove excess water, then place gelatin in a small bowl with the Frangelico. Set bowl over hot water bath to dissolve gelatin. In a large bowl mix egg yolks into the slightly warm chocolate. Add the warm Frangelico/gelatin mixture to the chocolate/yolk mixture. Fold 1/3 of heavy cream/sugar mixture into the chocolate mixture. Add remaining cream mixture and mix well. Pour into the mold, leaving ¼ inch space on the top. Melt chocolate for crunchy bottom. Add puff pastry (already baked and chopped in a food processor) and praline paste to the chocolate. When the mousse is set, spread chocolate mixture over each mousse without unmolding them. Put back in the freezer to set. When set, unmold mousse. Pipe a dollop of ganache on each. For ganache, melt chocolate; add cream, mix until glossy. Put chocolate sticks on top to garnish. While not my favorite event at Epcot each year, the International Food and Wine Festival, is a very popular happening in Epcot. This year its 12th annual kick-off weekend happens to be while I am down there for Epcot’s 25th, the event itself runs from September 28 until November 11 of this year. The Marketplace, small stands that provide various specialty foods and drinks, offers you more variety of food than you could ever possibly attempt to eat, even if you had an entire week. This year’s participants in the Marketplace are Argentina, Australia, Canada, Champagne, Chile, China, France, Germany, Greece, India, Ireland, Italy, Japan, Mexico, Morocco, New Zealand, Peru, Poland, South Africa, Spain, Turkey, United States, and the always popular (especially to those playing Drinking Around the World) Hops and Barley Markey. New participants this year include the Dominican Republic and Oklahoma, which has two booths in the Festival Marketplace, one themed around Route 66 and another highlighting Native American dishes. And here I only ever thought of Oklahoma as a state, and all this time it has humbly been hiding the fact that it had been promoted to a country. I feel the need to break into a rousing musical number now, but I’ll save you from that. There are also a number of fine dining experiences, discussions with chefs, some of whom come prepared with their own cookbooks, culinary classes, and wine tastings. Some of these events do not even require park admission, as some sessions will take place at resorts such as the Grand Floridian, the Contemporary, and the Yacht and Beach Club. The gathering that caught my eye was the Afternoon Tea with Stephen Twinning. That’s right, the man whose family has been making fine tea for ten generations is going to have four discussions on tea with an audience and afterwards cakes, savories, and tea, I bet they serve Celestial Seasonings, will be provided. Though events, like the one above, generally come at an extra expense I am of the general opinion that most of them are once and a lifetime opportunities and a bargain value as well. For more information on specific events, including what is sold out, prices, locations, times, cost, and where to call for reservations, I recommend you check out the extraordinary site over at allearsnet.com: Food and Wine Festival. Menus for the Festival Marketplace can be found at: Festival Marketplace. There has been a debate amongst Disney scholars and regular guests for a number of years. For a while the fevered contest will die away, there will have been no consensus reached, but everyone involved will simply agree to disagree. Then some rabble rouser will come along and stir the bees nest up again, and round eight-hundred and fifteen will begin. Well, I just happen to have a sharp stick today, and there’s a bees nest right here. For every Dole Whip conouser out there, there is an equally dedicated being devoted solely to the Citrus Swirl. Just so you know, although it doesn’t get mentioned nearly enough, the Citrus Swirl used to kick the Dole Whip all over the playground. These days the Dole Whip, in it’s coolly sponsored eatery, the Aloha Isle, has a piece of prime real estate in the heart of Adventureland just across the bridge from the Hub. Meanwhile, the Citrus Swirl, and its tropical stand, the Sunshine Tree Terrace, has been banished to a corner behind both The Enchanted Tiki Room and The Magic Carpets of Aladdin. As a result of poor sales due to location, location, location the Citrus Swirl has been forced to accept a cost that is twenty cents more than its competitor the Dole Whip. You’d have to be a truly dedicated soul to seek out a tasty treat that is not along the main walkway of Adventureland, and that costs more, but those of us that are truly in the know recognize the true greatness of the Citrus Swirl. For those of you wondering what this magical creation is that you have been missing out on, the Citrus Swirl is the delectable combination of concentrated orange juice and soft serve vanilla ice cream whirled together with some extra Magic. It may be an underdog in every other respect to the Dole Whip, but in taste alone, there can be no comparison. While the Sunshine Tree Terrace does serve other frozen goodies, such as Raspberry Lemonade Slushes, Root Beer, Sprite, and Coke Floats, and both the soft serve and orange concentrate on their own, the Citrus Swirl is the only reason to venture back to this little visited oasis. Though most of you are probably familiar with 2719 Hyperion and Jeff Pepper's amazing works there, I want to take a brief moment to wish him a happy anniversary! 2719 Hyperion turned one yesterday, and if the past year has been any indication, the future is bright indeed. If you know Jeff, wish him a happy one, and if you don't, well, it is about time that you do. The food of Walt Disney World conjures all sorts of memories to every person who has eaten anywhere on Disney property. Sometimes it’s a treat that can’t be missed, or the smell of the Main Street Bakery that reminds you of the time you saw SpectroMagic with your child for the first time, and there are even those instances where the name of a restaurant brings up memories so foul that you lost your appetite just thinking about them. Disney Delish is all about food and memories and traditions; so, for this week at least, we’ll cut the bad memories out of our dining delicacies and send them out with the trash this week. Since this is the beginning of the segment, I thought we’d start at the end, the end of my trips that is. No matter how long or short the trip to Walt Disney World, there is a single tradition that must be carried out the final morning of the excursion. Before I get on the road to come home I must, without a doubt, stop in at the Kona Café for some Tonga Toast. My fiancée swears up and down by the Macadamia Nut Pancakes, but she is wrong, the true delight here is the Tonga Toast. Tonga Toast, or more accurately Auntie Kaui’s Tonga Toast, is a concoction made up of extra thick slices of sourdough bread, topped with cinnamon and sugar, done up like French toast, and filled with bananas. It is then fried and served hot. These days with everyone feeling the urge to eat healthier, by the way, does Tonga Toast sound like it should even be in the same sentence as healthy, it can also be served grilled. A vegan Tonga Toast is also available, provided you give the chefs twenty-four hours notice. The story of Tonga Toast, as told to me by a wonderful young man who worked at the Polynesian, is that the recipe came from a cast member who worked at the Polynesian. She had grown up in Hawaii and brought this family recipe with her when she came to work at the Polynesian. It was such a sensation that it has remained a favorite of guests, and a menu staple, for over twenty-five years. Whether that is actually the case or not, it makes a lovely story to swallow between gulps of friend dough and bananas. My love of the Tonga Toast has gone so far, that I actually requested a copy of the recipe, and was provided with the recipe below. Oh, and if you are a coffee drinker, like I am not, I recommend the coffee at the Kona Café as well, it is second to none. How do I know? Simple, it is because even I have been tempted to try a cup after inhaling a single whiff of the fragrant scent. Whenever I put together a trip for friends and family, there are always some foreign terms they encounter that they want to know what they are, or what my opinion of these are. So this edition of Dis-tionary is going to be general vacation trip knowledge to those of you who in the Disney Geek category. While this information is regurgitated and available all over the web, I’m also going to put in my two cents on them as well. Keep in mind that the first two topics discussed today require that you are staying at a resort on Walt Disney World property, the third is for all guests with a valid park ticket. Extra Magic Hours (EMHs) – On any given day a theme park can open an hour earlier than regular park opening or stay open up to three hours after regular park closing. Water parks use only morning Extra Magic Hours. During these hours most attractions are available for you to enjoy. If a park is opening early, you will be required to show your resort ID (keycard) and have a valid park ticket. If a park is staying open late, cast members will be in designated areas checking tickets and resort IDs, after they check your IDs, they will give you a special wristband allowing you to stay in the park after closing. My feelings on EMHs are thus; I love this idea! Yes, it requires the park to close a little earlier some nights, I can remember when the Magic Kingdom was open until 12 or 1am without any extra hours, but I think overall it does draw guests to the resorts. Now, just because I love the idea, doesn’t mean I love Extra Magic Hours in their execution. In my travels I actually avoid parks with EMHs in the evenings, the crowds are insane and, unless you stay until the very end of the evening, lines are not any shorter. It seems that everyone can stay up late when they are on vacation. As for morning hours, the opposite seems to apply, not everyone wants to get up early enough to get to morning EMHs, and that makes them perfect times to make runs at the major attractions of a given park. Oh, and a final tidbit, Disney states that a park stays open up to an additional three hours, I have never seen an evening Extra Magic Hours that lasted less than three hours. Magical Express – Walt Disney World will pick you up at Orlando International Airport and deliver you right to your resort. They will also get your luggage and deliver it straight to your room. When returning home, they will pick you up at your resort and hand deliver you back to Orlando International Airport. Magical Express is a hit or miss with me. While it provides you with less stress, it also condemns you to only Disney transportation during the course of your stay. Sometimes having your own vehicle, or a rental car, is a blessing. You don’t have to get on crowded buses at the end of an evening where everyone is channeling Grumpy or Sleepy, or the occasional Dopey, you can also pick up groceries off property if you need them, and can make better time to the parks than the buses. Now, if you are planning on only using Disney transportation, this is a great benefit for you. Fastpass (FP) – Fastpass allows you to reserve a place in line at select attractions throughout the parks. Simply slide your park ticket at a Fastpass kiosk which will return your ticket to you as well as a second ticket that gives you a return time to enter the attraction with a nominal wait time. One fastpass is required per person, not group. You can obtain a Fastpass for another attraction after the window opens for your current Fastpass, or after two hours has passed, whichever comes first. If you know how to use the Fastpass system, this can greatly enhance any trip. That is to say you know when an attraction is worth using the system, what attractions run out of Fastpasses early, and if a wait time even warrants using a Fastpass. Going into that here and now would take quite a bit longer and begin to sound like an annoying buzzing in your ear. So maybe we’ll save that for a later time, a possibly break it up in a few segments. I’ll be headed down to Walt Disney World next Friday (September 28) through the following Tuesday (October 2) for a final trip with my Dad before my wedding. I will be there for Epcot’s 25th Rededication, the Celebration 25 group photo, and a Netcot get together. There will be plenty to talk about when I get back, and I’ll be letting you in on some of the new things I am going to be talking about near the end of next week, but in order to prepare for the trip I am going to start a series of articles tomorrow that deal with one of my favorite parts of any trip, the food. I know I’ve mentioned some treats and favorites of mine here and there, but now we’re really going to be cooking. Sorry, I couldn’t help myself. Hope to see you around the table tomorrow. Sorry again. No, your eyes are not deceiving you, that is indeed a Hidden Mickey inside of a ring. 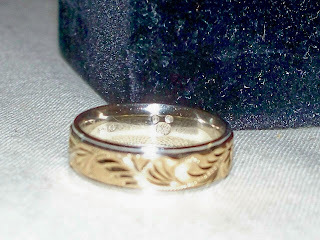 That is not just any ring though, and it also isn’t for sale; it is my wedding band that I will don on October 27th of this year. As much as I love having a true Hidden Mickey on my ring, this is not an idea I can take credit for. This was the creation of my fiancée Aileen and my cousin Ali. They could think of no better way to honor my love of all things Disney than to have it become a part of me permanently. Okay, that may have been an exaggeration, and you may think having a Hidden Mickey on my ring is a bit much, but to me Aileen couldn’t have done anything more to show me that she loves me, all of me. And if you ever run into me and would like to see the Mickey, just ask, I’ll be more to happy to add it to your list of found Hidden Mickeys. That is, as long as Aileen will allow me to remove the ring momentarily. That little ear and throat thing I had yesterday morning turned into a full on flu yesterday and today. So I am going to keep this short today, and get back to my rest, and fluids, and Disney movies. But just as I was feeling miserable for myself I remembered my friend Gretchen who told me about her first trip to Disney. Her family was headed to the Magic Kingdom via the ferry boat and she started to feel ill. She then proceeded to get sick all over a woman’s shoes. She walked up Main Street, took a left, and spent the rest of her day in the First Aid/Baby Care Center. They took exceedingly good care of her, and the courtyard area there is nice to look at, but it is not the key to the Magic. Oh, and this was the only day her family was there. So, when the germs and bugs get you down like me, and you are at home feeling miserable, remember my friend Gretchen. It could always be worse, you could be sick, and miserable, and missing out on all the Magic. I couldn’t sleep last night. My sinuses and ear were hurting, probably something to do with the fact that the weather has had a drastic shift here over the past 3 days. While stumbling around trying not to wake up my fiancée I realized a midnight snack (or in this case a 3:30 in the morning snack) was just what I needed. Unfortunately, we haven’t gone grocery shopping this week yet, so I was stuck with some crackers. What I really wanted though was pastry! And of course, I immediately thought of all the delicious bakeries of Walt Disney World. Of all the bakeries, the one that is forever my darling is the Boulangerie Patisserie in France, well, at least the France in World Showcase. I know that there are bakeries all over the world that have pastries that taste better and have more quality ingredients, in fact there are some in my hometown, but when I’m at Walt Disney World I can think of none better. Not only does it have delicious desserts, like my beloved Raspberry Schuss, but it actually has the corner bakery/café fell that you find all over France. The side street, La Petite Rue, that the Patisserie sits on does not betray a single glimpse to the rest of Epcot. There are a few small tables with enough room for a treat or two and drinks. Inside, the throngs of people are enticed by display cases full of worthy choices. However crowded the Patisserie feels, especially if a showing of Impressions de France has just let out, is precisely how a busy corner bakery feels in France, and most are no bigger than the storefront here. I can usually finish my Schuss or mousse in a couple of bites, but always like to sit for a few minutes longer to take in the various pieces of the ambience before moving on. I always feel a little more relaxed, and a little less hungry, after a short pause here. So if you’re in the mood to treat your body, this is your place. Maybe I’ll see you there; I’ll be the one with raspberry filling on my face with all my cares melting away. They say the place is haunted, sitting lonely at the end of Sunset Blvd. Your friends have dared you to go inside, grab some dusty token, and run back to them with proof you were inside. Seems harmless enough, the hotel has been abandoned since forever. Except, there are burn marks, like stripes on the front of the hotel, and every time you walk by you feel as if you are being watched, and sometimes, just sometimes, you swear you hear the sound of far away screams. But you’re no chicken. You find an open door on the side and, as you step inside, feel like you stepped back in time. It looks like people just left everything they were doing and walked away. You wander further and further in, past the tables and luggage, past the front desk where mail is sitting unopened behind it, and you enter the library. A book should do the trick, but as you turn to leave lightning strikes outside and the door slams shut, locking you in. Suddenly the TV clicks on and a man is telling you what happened to this hotel, and who it is who haunts it. While he talks you dash around the room, trying to find a way out. When he has finished talking a secret passageway opens, and since you cannot go back the way you came, going forward seems like a good idea. You enter the boiler room, where equipment sparks and cranks noisily. You come to a maintenance elevator. Now, what had that man on the television said about a maintenance elevator? You get on and, without touching a single button, the elevator springs to life and begins taking you up. Will you come face to face with ghosts and other weird things, or will the elevator doors open to a floor with stairs that you can leave by? Come to think of it, will this elevator hold up after these years and not drop you? It’s probably best to brace yourself for a fall, and for other strange events. If there is one constant it the world of Disney and transportation it is the Railroad. Rather than spout off a lot of facts and figures to you about the Walt Disney World Railroad (the engine colors, numbers, and names are Red: Walter E. Disney [Number 1], Green: Lilly Belle [Number 2], Yellow: Roger E. Broggie [Number 3], and Blue: Roy O. Disney [Number 4]) I decided to link you to a couple of places where there is more vital clues to the history of the Railroad itself. The Carolwood Pacific Society is an organization dedicated to the preservation of Walt Disney’s Railroad Legacy. Available here is the fine, not to be missed by Disney historians, book Walt Disney’s Railroad Story by Michael Broggie (Son of the late Roger E. Broggie). This is a download of a wonderful interview between Lou Mongello and Michael Broggie. Sections of the interview originally appeared on the WDW Radio Podcast. I want to leave you with two final thoughts about the Railroads before I go. One, I think the most poignant quote from the interview is the description of Walt’s Railroad, “Walt’s gift to the world was his park. And the ribbon around that gift was his railroad.” Secondly, the railroad in Fort Wilderness has long been a love of mine, even though it was gone long before I was born, and I plan on talking about this railroad in the future. Until next time, may you always find joy in hearing the whistle from the platform. The omnimover is a Disney staple. Of course it is, it was created by Imagineers Roger Broggie and Burt Brundage, and it was given its name by Imagineer Bob Gurr. So it’s not surprising with you think of classic dark rides like the Haunted Mansion, Spaceship Earth, Peter Pan’s Flight, and all the many incarnations of the Imagination dark rides, among many others they all run, of course, on an omnimover system. The omnimover itself was created to give guests a more cinematic view of the attractions, rather than just a static view. Moreover, it gave the Imagineers the ability to control the guests’ sightlines, increasing their ability to use special effects and lighting that could not be seen my guests that allowed for a more immersive experience. The omnimover added the ability, through the use of two separate control systems, to move up and down as the vehicles move through a track and to pan and rotate left or right. The perfect example of omnimover technology, especially for this series of articles, is the General Motors sponsored World of Motion. These cars had to rows of seats and moved through the history of transportation. From foot power, to the invention of the wheel, to far fetched images of tomorrow’s transportation, World of Motion covered everything. To say this attraction had little bearing on my young life would be a drastic understatement. My father has sold tires his entire life. He’s so good at it that his business was bought out so that he would stop giving the larger companies a hard time in the area. Not to mention he knows this stuff better than any man I’ve ever met. To give you an idea of what he does, his company buys tires from Goodyear, Firestone, etc. and he sells them to places like Sears, Quick-Tire, and the local mom and pop tire stand down the road. So watching the wheels being sold, alongside the Trojan Horse, in World of Motion, made me feel like my dad was this really cool guy that everyone had to come to. And, whether or not people have to come to him, he was, and is a cool guy. World of Motion gave me more respect for my father, and as his oldest and only son, I’m sure he appreciated that. The other scene that struck a cord with me was the Columbus scene with the sea serpent and the ships sailing off the edge of a map in the background. Since this attraction I have had a fascination with monsters and maps. I love collecting maps, and I love reading about monster, real or fictitious, my own creation or another author’s/moviemaker’s. So this may be the very point where I found both of these loves. Now, there are plenty of other little gems in this attraction, from the Dixie scene, to the holdup, to the boys chipping ice off the back of a refrigerator truck, but these are the two that really spoke to me as a child. World of Motion was open when Epcot Center opened on October 1, 1982 (its 25th is coming up in less than a month, I hope to see you there) and closed on January 2, 1996 to make way for Test Track. World of Motion’s omnimover track was the perfect instrument for this attraction, a smooth ride for a look back at the turbulent history of get up and get going. Oh, and the naming of the omnimover by Bob Gurr, he took it from the words OmniRange and PeopleMover. I’ve always had a fondness for the trams in Walt Disney World. Sure the openness has caused the occasional accident, and trying to cram on at the end of a marathon day may not seem like fun, but to me they are classic Disney. From the rough sandpaper seats to the reeking odor you are forced to endure every time the driver speeds up and the tram burps out a black cloud, I love the trams. Okay, so from those descriptions I’m sure you cannot wait to jump on one, or off of one and sustain a serious head injury, but stick with me on this one. If you’ve ever driven to a park then you know that the parking lot trams are the first time you board a moving vehicle that is entirely out of your control. And that can be a bit frightening, but to me it is exciting. You are free from the rest of the world, and this is your first push. Not to mention how much you can let your imagination run away with you if you allow it in the parking lot. As a child I used to read off the parking lot names, back when there were only two parks, as we approached the gates. Thinking back, I’m sure my parents thought it was just excitement bubbling over or a roll call of all the things to come, but to me I was immersing myself in something special. As a matter of fact, I still do this every time I drive to the parks, which is less often than I’d like these day. I was immersing myself in meeting old friends in the Magic Kingdom, friends like Minnie or Goofy or Chin and Dale, immersing myself in the discoveries I was about to make in Epcot, from Harvest and Energy to today’s Wonder and Amaze, in Disney-MGM Studios it has always felt like the butterflies before a performance on Stage or Film, and in Animal Kingdom I was finding my connection to, my place in, the world around me through Giraffe and Dinosaur. The trams were my vessel through these daydreams, or preludes to dreams I suppose. To take it a step further I would say this is what the goal of the parking lots were, not just an easy way to remember where your car is amongst thousands of others, but a preview, a way to tempt your palate. After all, the Magic Kingdom was always meant to be a show from the curtain of the Main Street Station to the final reveal of Cinderella Castle. Why then wouldn’t the names of the parking lots give you the same glimpse into the worlds you are a bout to visit than the wienies on the horizon of the Seven Seas Lagoon. And really, would you notice the lot names as much if you had to begin your day with a long trudge to the Transportation and Ticket Center, as you would as you were being whisked away to your adventure aboard a tram? No matter what the air smelled like? Outside of the theme parks, small ferries run from Port Orleans French Quarter, Port Orleans Riverside, Old Key West, and Saratoga Springs to Downtown Disney and back. Let’s not stop there though, let’s dig a little further and bring up some interesting facts. Looking at the extinct attractions at the Magic Kingdom, Swan Boats used to run around the moat in front of Cinderella Castle when the park first opened, and 20,000 Leagues Under the Sea used submarines! Additionally, there are miniature replicas of the Jungle Cruise boats at Shrunken Ned’s Junior Jungle Boats that for a few quarters you can pilot around a small pond. To give you another odd detail to think about, at Epcot you can find boats in The Land but not in The Seas. While Disney-MGM Studios have no watercraft that guests can ride on, there are boats used in the Lights, Motors, Action stunt show, as well as in Fantasmic! So, next time your feet hurt from walking all day long, take a moment to consider your day and take notice of just how much time you spent on the waterways of Walt Disney World. It is with a solemn heart that I inform you that Imagineer Ralph Kent has passed away this morning in his home in Orlando, Fl. He designed promotional materials for attractions like The Enchanted Tiki Room and training materials for the 1964-65 World’s Fair attractions. Later he became the Director of Walt Disney Imagineering East and a Corporate Trainer for the Disney Design Group. He will be missed. Yes, like you I run to one of the Disney Mountains the second they let me go into a park, but those are not my favorite rides, I just know that the lines are going to get long, and fast. The one attraction I must do every visit to the Magic Kingdom is the WEDway Peoplemover. What, they changed the name in 1994? Okay, fine, the Tomorrowland Transit Authority to most of you. If I don’t find a way onto the TTA I feel like I betray something. Sure, some people call this attraction, and rightfully so, the Napmobile, but for those of us interested in story there is none finer than the TTA. From development to back-story, there are a bevy of stories that lay ready to disclose their secrets. The Tomorrowland Transit Authority runs on linear induction. Now, I don’t want to get to technical and fry your brains, after all it is a Monday and we all have a long week ahead of us, and to be honest I’ve read a lot about it, and even I don’t really understand the science enough, but here are the basics. A linear motor uses AC electric motor to create linear force instead of torque. In the case of the Tomorrowland Transit Authority, this force is used as propulsion along with a magnetic field. Now, I may have severely butchered what linear induction is. If that is the case, please let me know because, again, I’ve read a lot about it, but don’t really understand the science, which was never my strong point. I have been trying to find information like Linear Induction for Dummies or a layman’s guide to linear induction but I have had no luck. So, let’s take a walk, or ride, through the attraction and find some of the true gems it has hidden for us treasure seekers. You’ll notice that the cars you are riding in are blue, which is because this particular branch of the Authority is the Blue Line. The Blue Line is meant to travel only within the city of Tomorrowland itself. But there are actually two other lines, Red and Green Lines, that supposedly could take you to other locales. The Red Line, for instance, is for interplanetary travel, for that perfect vacation to Mars. The Green Line would be more used by daily commuters rather than tourists as it would take them to the surrounding suburbs, no, excuse me, “Hover-burbs.” Traces of the other two lines can be found throughout Tomorrowland, as we as on the Blue Line itself. Now, as you first begin the trip it the Tomorrowland Transit Authority is touted as the Super Skyway. As casual as that observation is, there is a secret hidden there. The Skyway was a ride that took you from Fantasyland to Tomorrowland, and vice versa, in covered “bucket” or gondola type vehicles. When the Skyway closed in 1999 it left only the TTA as elevated transport in the parks, though it only had one station to board and disembark from. One can logically assume the Super part of the Super Skyway was due to the technology the TTA used and the speed at which it could safely travel. There are lovely references to previous Tomorrowland, not to mention Epcot, attractions along the way here. At one point a Mr. Tom Morrow is asked to give his party from Saturn a ring (pun imagineered for your groans ladies and gentlemen). Tom Morrow, as in tomorrow, was the man in charge at Flight to the Moon, an attraction that used to occupy the site where Stitch’s Great Escape now rests. Additionally, Tom Morrow 2.0 is a host at Innoventions in Epcot. But Tom isn’t the only character to make a jump from the Flight to the Moon site. Flight to the Moon became Mission to Mars, and the head honcho changed from Tom Morrow to Mr. Johnson. These days Mr. Johnson can still be heard on the TTA giving the traffic report. So if this Tomorrowland is truly the Tomorrow that Never Was, it has certainly learned a thing or two from its past tomorrows that never were. The piece of the TTA that is most near and dear to my heart is the model city. Some call it Progressland, some call it the original Epcot, but the Tomorrowland Transit Authority calls it Walt Disney’s 20th Century Vision for the Future. This was Walt’s dream, the city of tomorrow. Though the piece here is only a quarter of the original model, it gives you an idea of the scope of the dream, and just how meticulous Walt was in planning of everything he did. The model is presented by the Tomorrowland Metro-Retro Society. If that name sounds familiar, it should. The Society not only sponsors this treasure of the Tomorrowland Transit Authority, it also sponsors the Carousel of Progress and the now extinct Take Flight. Take Flight, incidentally, was originally Delta’s Dreamflight, but the name was changed, along with the sponsor, when Delta left. Some of you may not be looking for small details, you may just want to enjoy the ride, and that’s okay by me. In fact, if you are taking children, I recommend that the Transit Authority be one of your first stops in Tomorrowland. The TTA’s path travels through attractions like Space Mountain and Buzz Lightyear’s Space Ranger Spin, giving parents an excellent idea as to whether or not those attractions are suitable for their family. So, to all of you interplanetary travelers out there, feel free to skip the Tomorrowland Transit Authority. Or, if you’re so incline, take a light snooze through the attraction; the cast members will probably even let you take an extra trip or two if you need a longer nap. But, as for me, I’ll keep my eyes to the future that never was, because there are some awfully exciting things to see on the Blue Line. Hidden Mickey Alert: The woman getting her hair done along one of the interior tunnels has a Hidden Mickey on her belt buckle. In your travels you will encounter forms of transportation you had thought only existed in your dreams. Yes, it is true you will ride the rails to various lands, some of these lands are old friends while some are wild, even in comparison to your imagination. Along the way you will encounter new people and untamed creatures, all are there to further your love of exploration. There will be cars, surely, but there will also be boats of all shapes and sizes. Some will be enclosed to keep you dry and cool, while others open so that the wind fills your hair and offers you strange scents of far off adventures that are calling to you. There will be electric carts at your disposal, trams filled with other explorers, worriless elevators that scream skyward past traditional stairs, and even an occasional horse for when the trails invite you down their long and dusty ways. And should you travel further through the lands of your imagination than you ever dreamed, you may just find tomorrow, and there are wondrous ways of moving about there. From a hushed highway in the sky, called a monorail, to the local peoplemovers that whisk you away to daring quests. Then again, you may find that your own two feet will carry you everywhere you ever needed to go. This week we are going to take a look at the various modes of transportation in and around Walt Disney World. We’ll look at the parking-lot trams, resort busses, boats like the Liberty Belle and the Admiral Joe Fowler, to ride systems like the omnimover, and an overly loving look at one of my favorite pieces of Walt Disney World, the Tomorrowland Transit Authority (or WEDway Peoplemover for those of you old school fans like me). But today we have to start with the quintessential form of transportation. When you hear the words transportation and Walt Disney World the first thing you think of has to be the monorail. The monorail is not original to Walt Disney World, in fact it isn’t even originally Disney (-land or otherwise). Efforts to create a new rail system for public use that was cheaper and faster, as well as more cost effective than other forms of transportation, date back to the early 1900s. Monorails have always been seen as the transportation of tomorrow, but that tomorrow has always been just a day away. As for the influence that the monorails have on the world of Disney, that influence goes back to Walt’s fascination of transportation, specifically trains. The first monorails, the Alweg Mark Is, were installed in Disneyland’s Tomorrowland as a sightseeing tour in 1959. Over the years they were upgraded several times with the Mark IIs, Mark IIIs, and, most recently in 1987, with the Mark Vs. When Walt Disney World opened in 1971 the Alweg Mark IV monorails were there, transporting guest between the resorts, the Transportation and Ticket Center (TTC), and the Magic Kingdom. In 1989 the first of the Bombardier Mark VIs began their tours of Walt Disney World, which aside from the resort line, now including the Grand Floridian in addition to stops at the Polynesian and Contemporary, and express line between the Magic Kingdom and TTC, now included the line to Epcot, which began in June 1982. The Mark VIs are the current monorails of Walt Disney World, though the fleet is currently undergoing minor refurbishment. The six car trains can be distinguished from one another by their stripe along the side of each train; these stripes along the side also give the monorails their names. The current fleet at Walt Disney World is Monorail Red, Monorail Pink, Monorail Coral, Monorail Green, Monorail Lime, Monorail Blue, Monorail Purple, Monorail Yellow, Monorail Orange, Monorail Black, Monorail Silver, and Monorail Gold. Some of my most memorable moments in the history of my Disney Life are the trips on the monorails, specifically riding in the front with the pilot, being able to see all the Magic and adventures that were in front of me. A fascination with the monorails is not limited to only myself in my family, my father has, on more than one occasion, articulated how much he wants to pilot a monorail when he retires. I don’t know if he is captivated more with monorails or the ability to interact with other guests, but I know this has been a long standing dream of his. There are other ways to have fun with the monorails. There is a game popular amongst the alcohol imbibing youth called Drinking Around the World, in which you have a drink at every destination in Epcot’s World Showcase. My friends and I, a few years removed from such youthly enterprises, have modified this game to only include resorts with monorails stops. Though others probably have this same game/tradition, only with another label, we still call it Drinking Around the World. With the consumption of less alcohol, as well as the environment in which we are drinking, we feel a little more mature than our World Showcase brethren, though I’m not sure if that is truly the case. There are even people who get so excited about the monorails that the feel the need to take their clothes off and take pictures on them! I don’t recommend this, as many many complications could ensue from this, but, to each their own. When Disney-MGM Studios opened in 1989, it was the first theme park to open without a monorail station. This new tradition continued when Animal Kingdom opened in 1988. Though rumors persist of new monorail lines to various resorts and the other theme parks, I don’t look for this to be happening anytime in the near future. However, this lack of monorail stations makes from one of my favorite monorail references. A short-lived show in Disney-MGM Studios called Here Come the Muppets had an exchange in it where Kermit asked Fozzie where everyone else is, to which Fozzie replies “Oh, they’re coming on the monorail.” Kermit reports to Fozzie that the monorail doesn’t come through here as the front of a monorail crashes onto the stage. The crash is followed by Fozzie telling him that “It does now,” and Animal bellowing “MONORAIL, MONORAIL” as he disembarks. Though the future of the monorail as a form of urban transportation is uncertain, mainly due to its commonality in the theme parks, which causes the general public to be unable to see its advantages outside of these boundaries, it continues to reinvent itself. While I would love to be able to hop on a monorail station in my backyard for a quick jaunt to Washington D.C. or to a beach, I will be happy to settle for my occasional trips around the World, so long as they are available. And, as I said in the beginning monorails have always been seen as the transportation of tomorrow, but it is unclear as to when that tomorrow will become today. Refurbishment – Also known as refurb, refers to an area, whether it be an empty spot of land, an attraction, a piece of an attraction, or any other area that is visible to guests, that is being plussed or redone. Examples include turning Mr. Toad’s Wild Ride into the Many Adventures of Winnie-the-Pooh, repainting a bench, or adding a water fountain or handrail. Queue – The queue is the area you wait in before getting to the actual attraction. Some are bland and consist of only switchback lines, such as Peter Pan’s Flight, while others give you whole back stories about what you are getting ready to experience, like the Yeti memorabilia and paraphernalia spread throughout Expedition Everest, and still others are films, like the pre-show dream sequence in Ellen’s Energy Adventure. Wienie – A wienie is the term Walt Disney coined for a show element that invites you into an area/space and piques your interest for a closer examination. Each park has a park icon, or wienie. In the Magic Kingdom it is Cinderella Castle, in Epcot it is the geodesic sphere of Spaceship Earth, in Disney-MGM Studios (Disney’s Hollywood Studios) it is the Sorcerer Mickey’s Hat, and in Animal Kingdom it is the Tree of Life. Wienies are also used on minor scales through out the parks, such as the various mountains (Space, Splash, Big Thunder, and Everest), the pavilion icons in World Showcase, and the AT-AT outside of Star Tours. Peglegged Pete was an original, a pirate’s parrot to be sure. Before the 2006 refurbishment of the Pirates of the Caribbean attraction Pete (or Polly, depending on your source for the parrot’s name) perched atop a pillar just outside of the entrance beckoning guests inside with whistles and other pirate speak, as well as with his trademark song, “Yo Ho! Yo Ho! A Parrot’s Life for Me.” He was impossible to overlook. Not only was Pete brassy and loud, he also had a distinct look. A green parrot, complete with hat, scarf, pegged-leg, eye patch, and a shaved chest tattooed with an anchor. For a while after the refurbishment that added Captain Jack Sparrow to the attraction was complete, it seemed that that salty dog (err, parrot) Pete had retired. However, like most pirates, he found giving up the life a bit too difficult, and retired life too tedious. And so he has rejoined us, albeit in a lesser capacity. These days if you’re looking for Pete, don’t bother searching the dimly lit hallways of Pirates of the Caribbean. Don’t even buy a ticket and look in the various theme parks. Nope, Pete has taken up residence in Downtown Disney’s World of Disney, in the pirates’ section of the store, of course. I miss Pete calling to me as I walk the alleys of Adventureland, and wish that he would fly over for a spell. But it’s good to know you can’t keep a good pirate parrot down, even if you take his leg, eye, clip his wings, and make him settle for an early retirement. DISCLAIMER: I never wanted to issue a disclaimer for anything I write, but I felt this topic warranted it. Tonight I want to talk about the community, specifically the forums, of the Walt Disney World community. This article is not going to endear me to every one. In fact, it may turn some of you against me. However, should you disagree with my points, as presented hereafter, I hope that you’ll email me to discuss your viewpoint, as I am not trying to isolate any of you. If you are afraid that this article will offend you, but would like to read more of the blog, I suggest that skip down past the first article or come back tomorrow when I have something more light-hearted I plan to discuss. I’ve stated before that I wanted these discussions to be open to anyone who wants to share their opinions through comments or emails, and I meant that. I said that in reference to the fact that I believe that Walt Disney World was created for all of us, and that any discussion of Walt Disney World should be for all of us as well. I didn’t mean that only for the Main Street Gazette, I meant it for the Walt Disney World community as a whole. No matter what the topic, people are bound to disagree, sometimes violently over trivial things, but that is the nature of being human and having a free will. We should never, ever, have to agree. And, as much as it pains me to say this, Walt Disney World is, in all actuality, a trivial thing. Yes, it means a lot, everything, to some of us. Yes, it is the livelihood of people in this world. And yes, it is so vast that everyone has an idea, opinion, or firm belief on one of a million different topics within the boundaries, physical and imagined, of Walt Disney World. But no, this does not give us a blank check to lose our common sense, and courtesies, we should share with one another. There are forums out there that block the names of other forums within any post on their sites because of incidents that happened years ago. These are incidents that only a handful of people can even remember what the original episode was in the first place. Believe me on this, try to find any information on why this is going on on a given site, and no one knows. And getting answers from administrators is another mess altogether. I know. I’ve tried all the angles in a number of places. Some of you may know, or be a part of, these sites, but I am not going to name names, that’s not what I want to accomplish. That is simply opening old wounds, and this article is about rebuilding and reconnecting, not tearing each other down. To put this in a more realistic perspective, think about a close friend you had in high school, or junior high, that stole a girlfriend/boyfriend. Remember the fight, verbally or beating the snot out of each out, that incident caused? The rift became so large that eventually to the two of you were not speaking. Looking back now, you don’t know what happened to that person you wanted to date, and frankly, you don’t care. But what about that friend you lost? You have to admit to yourself there was something about them that you miss having in your life. This virus that is spreading throughout our community falls within the same principle. Sure, you may not see eye to eye with everything everyone has to say all the time, but wouldn’t it be nice to be able to talk about our differences rather than shun one another? Besides that, a person who may be new to the community could be looking for a resource not available in a given forum. You know of another forum, one you don’t necessarily agree with, but that is perfect for what this new member is looking for, but you cannot even pass that information along since that forum is the Forum That Shall Not Be Named. And then, who are we really hurting? Besides the fact that these occurrences are isolated, but are isolating fabulous sections of our community, the other nightmarish, almost big brother, aspect to all of this is that most of us who interact in the Walt Disney World community are adults. That’s right, highly educated people who don’t need to hide from confrontation in our daily lives are being censored. Choices should be allowed to be made, if you don’t like something, you don’t have to listen, read, watch it, and no one should be making those decisions for you. As adults I firmly believe we are able to govern ourselves and our community. Does this mean that a troll who continually uses profane language should be allowed to say their peace, or attack anyone’s perspective, just because they can? Absolutely not, there are boundaries to everything. Should a site be blocked for giving a critical analysis of another site? Definitely not. Blocking these sites may just be a knee-jerk impulse to shield one’s self, since they believe they have a perfectly fine product. But the truth is, none of us are perfect, and thus, no site will ever be perfect. The loss of common courtesy is not limited only to our forums. It is in the news almost weekly. Guests are attacking other guests in queues, guests are spitting and cursing at other guests passing by, and even cast members are being unprofessional, or unmagical, with the guests. In this day in age when there are so many ways to disconnect with the world, shouldn’t we find more productive, and joyous, ways to connect to one another when given the chance? This has been my manifesto on the topic. I hope I don’t have to bring it up again, but I reserve the right to reexamine the idea later. I don’t want us all to just get along, after all, the Happiest Place on Earth makes us all happy for a variety of reasons, I just want us to remember that everyone has their own thoughts, dreams, perspectives, and firm beliefs. And that is a wonderful thing that we should cherish, not spurn. There is a mystery and beauty in Norway, beyond the stave church, 14th century fortress, and the town square. There is where you will find the Maelstrom, a turbulent journey through the many faces of Norway. Should you not believe in trolls, magic, and the history of the world of Odin, this is not the voyage for you. However, if you are open to ideas beyond your own, you may find the supernatural you are looking for. For as they say, you are the first to pass this way. Through ancient forests, swamps, and ice floes you shall pass, encountering trolls, polar bears, and the raging sea, and only then will you truly identify with the spirit of Norway. Now, the Vikings have sent a dragon-head ship to guide you safely, should you be willing to embrace their mystery and beauty. As you make your way through the winding backroads of mystic Asia, search out the Kali River Rapids Expeditions for a white water adventure. While you are booking passage on the Chakarandi River, take note of the striking artifacts the rafting company has gathered over its many years. Now board your raft for a thrilling journey down the Chakarandi white waters. You will see gorgeous bamboo forests, native creatures, and ancient temple ruins which were dedicated to the earth on which we thrive. As you pass through the mists you will swear that you taste the sweet jasmine on your lips. Beware though, it is said that loggers no longer treasure the lands that have for so long protected them, and are now slashing and burning their way through the forest. The earth can be a fickle friend, and should you see these loggers, the earth may just try to reclaim you, as it surely will them. Well now, your raft has arrived. Good luck, and have a safe journey my friend. Besides what I consider to be the best chicken tenders on property (especially with the barbeque and honey mustard sauces available here), the Columbia Harbour House is full of stories just waiting to be unlocked. Nestled in the corner of both Liberty Square and Fantasyland, the Columbia Harbour House does its even best to feel at home in both lands. In fact, if you check out the external architecture, specifically the section that creates an overpass between the two lands, which is in reality part of the dining area, you can see just how seamless the details of both lands are intertwined. Take a step back from the bridge, on the Liberty Square side, and take a view into Fantasyland. Rather than brickwork, which is the hallmark of Liberty Square, you’ll see small sections of stonework that definitely looks as if it would be more at home in Fantasyland. This works on both sides of the overpass, I suggest that you take a hard look at both sides next time you pass through, see how many pieces of the opposites land’s architecture and theme you can find on each side. Before going into anymore detail, I would be remiss if I didn’t mention the origin of the Columbia Harbour House name. The ship Columbia was the first United States ship to circumnavigate (circle) the world. As well, the name is homage to the Sailing Ship Columbia, a replica ship of the original Columbia, which resides in Disneyland. Inside there are fantastic details everywhere, from a replica of the Columbia’s figurehead in the ordering area, to lighting fixtures made out of old Captain’s Wheels, to the ship models and advertisements of ships seeking passengers. My personal favorite is the exhibit showing various knots used on seafaring vessels. The original Columbia was not, in all actuality, a naval vessel. That is, that it was from the United States, but was not part of the navy, and it certainly never saw battle. This is fittingly depicted throughout the two floors of the restaurant, as there is plenty of maritime memorabilia, but very little in the way of naval paraphernalia. This is absolutely a place I do not ever miss on my visits. I do attempt to try new places on every trip, but the Columbia Harbour House is never off the list, no matter how short the visit. The amount of time you could spend simply taking in the atmosphere of this place makes it a must see for anyone. Of course the fact that the do indeed have the best chicken fingers on property just adds to the experience. Hidden Mickey Alert: On a wall across from the ordering area, on the first floor of the Columbia Harbour House, there are a selections of maps that form a Hidden Mickey. Now, while I have you here, it has been brought to my attention that people would love to see some of the things I talk about here in pictures. I would love to post pictures of Scoop Sanderson, the knots in the Columbia Harbour House, Spaceship Earth, or the Disney Gallery. I have a vast collection of pictures other people have taken and posted on their websites, blogs, or on forum boards, but I only use those as a way to look back at the Magic myself, I do not feel it appropriate to use their pictures, even if I were giving credit where credit was due, without their say so. I have tried a couple of times to obtain permission of a few photographs, but the end result would lessen what I am able to do for you here since I could write an article, and then possibly spend weeks waiting for permission, leaving the few of you who have found this site with very little in the way of new content. What about my own pictures? Well, most of my photographs are all in albums or boxes, not in any sort of digital medium. Now, I am in the process of fixing that, especially since I will have a digital camera just in time for my next trip down to Walt Disney World at the end of the month and my first trip to Disneyland for my honeymoon at the end of October. So, until then, we’ll both just have to use our memories and imagination. By the way, if you are one of the few who have found this site and keep coming back, thank you so much. It means more to me than you’ll ever know that you have some faith in this project I have undertaken. I would love to get some feedback from you all. So feel free to leave a comment on a topic, or send me an email telling me what you like, what you don’t like, or what you’d like to see. After all, Walt Disney World was created for all of us, there is no sense in creating a site dedicated to such a place if you were not going to create it for all of us as well. Hidden Mickey (CMs) – A Hidden Mickey is a representation of Mickey hidden throughout the Disney parks and resorts by Imagineers. The typical Hidden Mickey is the iconic three-circle head of Mickey, but silhouettes of Mickey, as well as other characters, can count. Hidden Mickeys can be sculpted, painted, etched, carved, and even grown into anything and everything inside Walt Disney World. E-Ticket – Before rides were included in the general admission price of visiting a park, separate tickets, most commonly sold in books containing a variety of tickets, had to be purchased for each attraction at Disneyland, and later, the Magic Kingdom. Attractions were given a level, A through E, based on how popular or how recent an attraction was. A-Tickets would allow you to experience attractions like the Main Street Vehicles, while E-tickets would include such attractions as Space Mountain. Today the term E-Ticket is reserved for discussing attractions that are the peak of entertainment within their respective parks. E-Tickets include (but are not limited to): Space Mountain, Splash Mountain, Soarin’, Test Track, Tower of Terror, Rock ‘n’ RollerCoaster, and Expedition Everest. Plussing – Plussing is the idea of making an attraction (or show, façade, store, walkway, sign, or anything) better. Whether the idea is in its early stages, or already on stage in the parks, an Imagineer can always go back to an idea and plus it. The term plussing comes straight from Walt Disney, and it was a way of life, not a suggestion, within the Disney culture. For more information on Hidden Mickeys, I suggest Steven M. Barrett’s Hidden Mickeys books for Walt Disney World and Disneyland. Seeing as how Epcot’s 25th is only a month away from today, and since I’ll be celebrating with it in October, I thought now as good a time as any to give you some unique insight into it’s growth and history. This October 1 Epcot turns 25, and last December I turned 25, so, you might say we’ve grown up together. Like any 25 year old, Epcot has gone through some growing pains, and it isn’t done with these pains either. But let’s take a look back, and through, the history of this young whipper-snapper, and see how it faced its first quarter century. First of all, Epcot is 25 now, a young adult; it doesn’t want to live with the name it was born with. It wants a cool name, one it has chosen for itself as it matured. It is no longer EPCOT Center, it is Epcot. It would prefer you refer to it as such and stop picturing it crawling around in its diapers gurgling about tomorrow. However, if you can’t help yourself, it understands. While we’re on the topic of names, it understands how juvenile it was to address itself as Epcot and a year, a la Epcot 94 and Epcot 95, but that was during its tween/teen years and it has put that insanity to rest. When it was first born some thought Epcot was adorable, while others thought it was an ugly baby who would never hold a candle to the success of its older sibling. As it made its way through its formative years people began to see it less as the kid brother and began to see its true, albeit different, identity. Epcot was not Magic King 2.0, it had never wanted to be, and it took a great many people, a great number of years to see that. It had more aptitude for broad ideas and technical skills than its older brother’s fascination with adventure, story, and fantasy. EPCOT Center, err, Epcot, had indeed become its own person. As with most young children Epcot was changing and learning more about itself every day. The voice it had gained in its early childhood, Epcot held on to firmly throughout its adolescence. True it did give up some childish pursuits, such as the idea of incorporating the entire world into its dream, and giving each one of these representatives an attraction worthy of its host nation. However, while it couldn’t get the whole world behind it, and let’s face it, who can, it didn’t stop it from sharing its message with the whole world. As it grew, some missed the unabashed free spirit and blue-sky ideals that EPCOT Center had had as a child, but, it was continuing its path into young adulthood. We have all certainly learned the lesson that growing up means losing pieces of one’s childhood, whether through our own past or those of our children, and Epcot was no exception as it ventured into the frightening years of being a TEENAGER! As Epcot entered its late teens, the greatest shifts began to happen. It moved more away from family connections and more into pursuing its own adventures. If one thing stayed constant, however, it was Epcot’s joy of all things technical. Now this technical passion and know-how shifted slightly. Rather than take a look a possible future ideas and expansions, Epcot turned to cool internal technologies. It had lost much of what had defined it during its early years, and what was cool and popular had now made an impact. History, possible futures, and base science were overshadowed by speed, thrills, and pop culture icons. No longer was edutainment enough, Epcot wanted the cool gadgets, gizmos, and identity that the cool people would think was cool. Concepts that pushed today’s technologies to the limits, or dreamed of tomorrow’s limits, no longer interested Epcot as much as high-energy technologies like centrifuges and fitting more computers into a vehicle than those on a Space Shuttle. As Epcot entered into young adulthood, it realized that it had burned some of its bridges that it had struggled so hard to find in the first place, and began to correct some of these errors as best it could. It understood now that hip is only hip for a moment, that tying yourself to something that exists only in the moment can only serve to date you, and can rapidly cause a fall from graces. Epcot sought to renew its creative processes. However, regaining some of the creativity that it had lost along the way would prove more difficult than it first thought. After all, bridges, once burned, are no so easy to rebuild. Yet, as Epcot was becoming more of an adult, it also understood itself more innately, accepting its new found intellect and humility, and felt it was up to the challenge. Thrilling, sometimes dangerous, technologies were made family-friendly, body art was surgically removed, and it even put a few baby pictures in places those in the know would look. These days, like every 25 year old, there are still things that you wish Epcot would change, and some qualities you hope it keeps. Overall, we are proud of what it has made of itself. Epcot is still young, but it understands and recognizes enough of its past, and appreciates that it still has time to grow and shift. And, in the end, all we can really ask and be thankful for, like any parent, friend, or family member, is that we will be able to continue to watch it grow.